When constructing a ventillation system, it is important to ensure that all of the vents and pipes are properly supported. With this strong strap, you can minimize the stress on your fireplace's vent system, and you can improve the quality and the security of your piping. The straps can help lower the stress on your pipes, creating a longer lasting ventillation system for your fireplace system or heating appliance that uses durable materials and air tight connections. 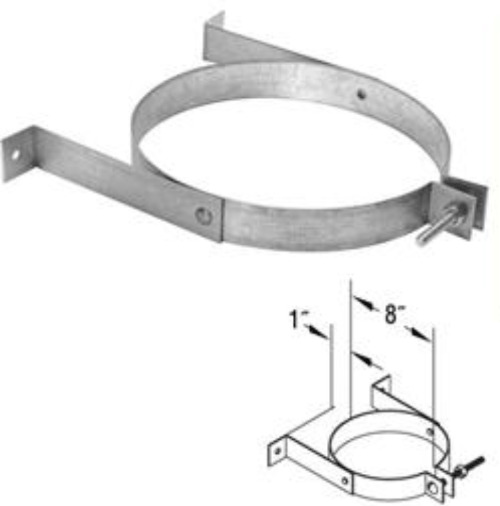 How many inches is the mounting bracket center hole to center hole? Per the manufacturer, the mounting holes are drilled 9 1/8 inches apart from one another on this bracket.